Windows Vista product key (sometimes also known as CD key or serial number or license key or the highly value and sought after volume license key or VLK) is the most important element in your Windows Vista, in the sense that the produce license key will determine whether your copy of Windows Vista is genuine or counterfeit, or whether you can successfully activate Windows Vista properly. Thus in some circumstances, where you unable to activate or fail WGA validation due to compromised, leaked, blocked or violated product key, you can change Windows Vista product key after installation, without the need to reinstall Windows Vista. Run Elevated Command Prompt with administrator rights or privileges. To do so, locate Command Prompt icon in Start Menu, right click on it and select Run as Administrator. You can also type in “command prompt” in Vista instant search, and right click on Command Prompt shortcut and then select “Runas Administrator” to enable administrator credentials. Answer Yes to any UAC confirmation. You can also turn off UAC. Replace <insert your product key here> with the 25-digit Windows Vista product key. If you don’t prefer to issue commands manually on command prompt, you can use the Windows GUI (graphical user interface) to change product key. Click on Start button, then Control Panel, and then select System (for classic view of Control Panel). Click on Start button, then Control Panel, and then System and Maintenance, and then select System (for normal view of Control Panel). At the bottom of the System Properties window where “Windows activation” section located, click on a blue link named Change product key with a small shield icon next to it. Your system might need a second or two to display the change product key dialog after clicking on the link. 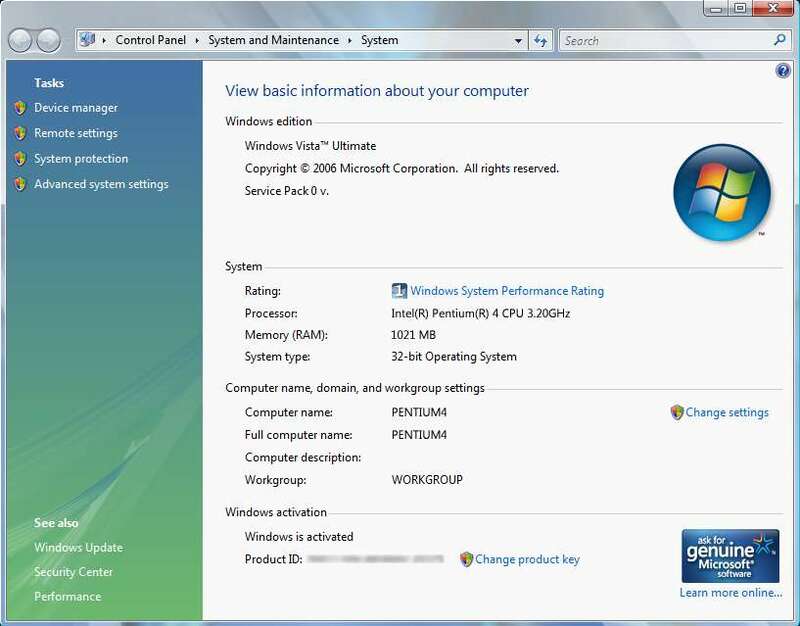 If Windows Vista system already in Reduced Functionality Mode, there is an option of “Retype your product key”, which is the same as “Change product key” above and will give you the opportunity to enter a new product key or license key if you want to activate Windows Vista with a new key that is not yet installed on the existing installation of Windows Vista.